Your engine and your transmission are the two most important parts of your vehicle, and if you want to keep your automobile running for as long as possible on the road, you should treat your transmission right. However, unlike engine oil changes, where everyone tends to have a very clear idea of what to do and how often to do it, not as many people are familiar with transmission service and when to do it. We get it. If something isn’t familiar, feels foreign, or is outside our normal routine, it feels like a lot of effort to do it. However, you shouldn’t let the unfamiliarity of transmission service stop you from getting it done. Your vehicle’s transmission is at stake. Did you know that transmission problems are one of the top causes of roadside breakdowns? It’s true. Any kind of breakdown can put you at risk of danger or injury, and even the ones where you’re safe are an inconvenience at minimum. However, there are few things that can make your heart sink like hearing that your transmission was the reason you broke down on the side of the road. Avoid having that happen by getting your transmission serviced at the proper intervals. 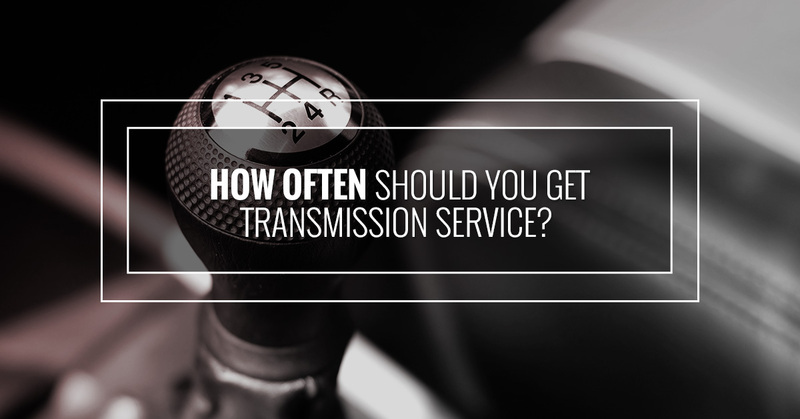 There are several aspects to your transmission service, and each one should be done on its own schedule. In addition, different vehicle manufacturers have different recommendations for when you should service your transmission, so be sure to check your user’s manual. Also, automatic transmissions should be serviced at a different time than manual transmissions. With those disclaimers, here are some general recommendations for how to schedule your transmission service. The amount and type of driving you do will cause your transmission fluid to age faster. Not every vehicle has a transmission dipstick, but if you do have one, you should be sure to check it regularly and schedule your transmission service before your transmission fluid starts to look brown or smell burnt. Once this happens to your fluid, you’re setting yourself up for transmission problems down the road, so be proactive about getting transmission service before your fluid starts to be degraded. The best transmission shops will offer you a transmission service where they actually drop the transmission pan, clean it from any debris, replace it, and then refill the fluid. Debris in the gears is a big cause of transmission failure, and the only way to get rid of this debris is to remove the pan. Remember that transmission oil costs a whole lot less than a new transmission. You can prolong the life of your transmission through giving it regular maintenance. Keep your vehicle in tip-top shape by regularly removing the sludge that would put your transmission at risk, and reduce the risk of having your transmission prematurely fail you. Get regular transmission maintenance right here at MC’s Transmission, your trusted source in Northville, MI and the surrounding communities of Farmington, Livonia, Novi, Wixom and South Lyon, Canton, Plymouth Charter Township, and Salem. We are here to perform transmission repair and service for you, so contact us today to schedule your appointment.